A 90-year-old property that is now well maintained and modernised to today’s building standards and colour schemes. The existing paint, and underlying coats had failed, resulting in the need for surfaces to be stripped to bare timber before painting commenced. The task of scaffolding the two-story property, both in access and scaffolding. Removing lead based paints from the site. Health and Safety Compliance in the use of respiratory masks and gloves. Maintaining a clean work site with appropriate disposal of stripped material. Full warrant of fitness carried out - Roof removed and replaced with colorsteel and large amounts of rotten weatherboards replaced. Happy customers and positive feedback to friends, family and co-workers. 10-minute walk from Island Bay village, the stunning outlook from the property is realised when reaching the top of a path, which zigzags its way to the front deck and entrance doors. The site, coupled with its double story construction, ensures the 1930-character home all day sun and expansive views. The completed external works complement the properties fully restored interior, providing modern living in an early century home. Inspection of the surfaces showed many areas of crazed, cracking, peeling and flaking paint. We soon realised that the initial undercoat applied on the exterior, at time of construction, had failed. Our quote therefore was to strip the surfaces back to bare timber and remove the many coats of paint applied to the property over its 90-year existence. During the paint removal process it became obvious that the house was also in desperate need of repair to its timberwork and joinery surfaces. With the scaffolding still erected, the client made the decision to have the rusted galvanised window flashings and hinges replaced with stainless steel and window sashes re-hung with correct clearances. The existing iron roof was also removed and replaced with colorsteel roofing iron. 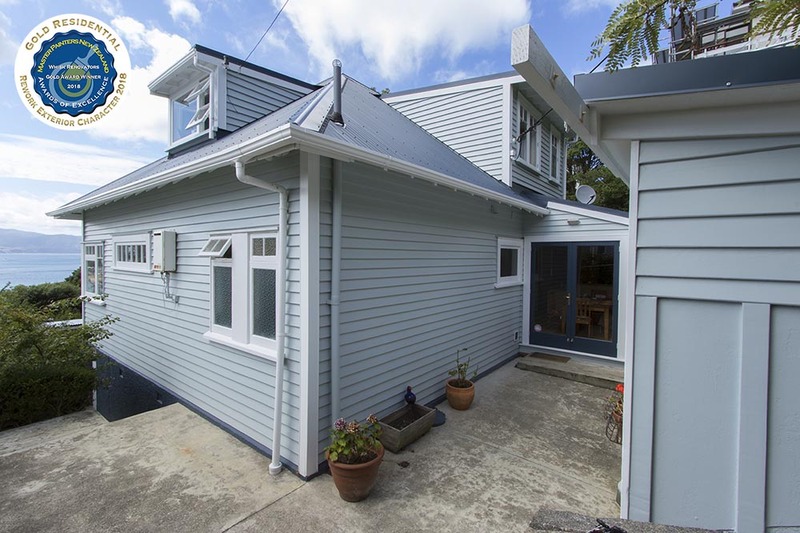 The weatherboards, bargeboards, windows and doors were Matai and Cedar, with the entrance porch consisting of pine from a renovation in more recent years. The weatherboard profile was bevel back weatherboard which had several areas of rot replaced and machined to ensure a seamless transition from existing to newly installed timbers. Stripping paint from any house built before 1978 raises the question of lead. Given the number of coats on the Derwent Street house, we had no doubt about the presence of the heavy metal. Tests were carried out, proving positive to the paints containing lead. Measures and steps were taken to remove and contain the lead, whilst also protecting the surrounding areas and gardens. At all times we used our industrial outdoor vacuum to keep areas clean and free from contaminates through our daily activities. One of the biggest challenges was the Wellington weather. We carefully planned our days to remove paint from the building, waiting for days that were still or with little wind. This avoided stripped material from being blowing around the section or onto neighbouring properties. Whilst sanding and removing material we took the mandated safety precautions in the use of respiratory masks and gloves. The material contained on drop sheets was then simply bagged and disposed of appropriately in accordance to its requirements. There are three basic methods for stripping paint-grinding, applying heat, and using chemicals. After considering all the different options available and the property we were dealing with, we elected to apply heat to all surfaces. Heat stripping requires careful attention to both the surfaces being heated, as well as avoiding surrounded areas such as downpipes, spouting, electrical cabling, gas piping and glass etc. Because we are also aware of the potential risks with heat stripping, our company and our staff have been effectively providing a cost-effective heat stripping option to our clients for 12 years+ with great success. As with all stripping methods that involve removal of coatings to bare wood, rusted nails are exposed and were subsequently nail punched and treated. Surfaces were then sanded before the first coat of primer was applied. We machine sanded surfaces with 80-grit sandpaper to get a good tooth for the first coat of primer to adhere too. We are firm believers that the first coat applied is your best coat, so all necessary steps are taken to ensure the surfaces are well prepared for coating. Dulux Total prep was applied as the first coat followed by contract filling of holes and indentations. All surfaces were again sanded, filled areas primed and gap sealant applied. Two coats of Weathershield X10 Semi gloss were applied as a finishing coat. The Windows and doors were finished in Dulux Aqua-enamel gloss. Was there a particular area that needs accentuating? These, and other factors, were taken into account to ensure the right colour palette was chosen. so that the colour linked all the key elements together, to produce a beautiful looking home. A 2-story home on an elevated section. Dormer windows on all four sides of the upper story to enhance the era of the home, size, outlook and street appeal. Elevated section off the street with views over the surrounding suburb. Sympathetic Colour scheme to its water views and bush surroundings. Features of its era have been maintained and retained, providing elegant lightness to complement its solid construction. The property was completed in July and has been the discussion of many in the suburb. The Clients are extremely happy with the processes quoted and the workmanship with which it was carried out. They set about the enormous task in not only having their home painted, but also having all existing paint stripped from top to bottom as well as the roof replaced. All maintenance work was done as discovered and in doing so, protected the properties character and integrity. They are thrilled with the properties look and feel, and have restored it to its former glory while introducing today’s modern colour schemes. Copyright © Whisk Limited. All rights reserved.